This soup is tasty but not very pretty. Serving it in your finest china (or a mis-matched set you found at a thrift store!) makes it feel fancy and special. Soak the beans overnight or heat to just a boil then allow to soak for one hour. Drain, rinse and cover with fresh water, then simmer beans with a flavoring element (smoked tomato, smoked jalapeno (chipotle pepper), ham bone, etc) until soft and creamy but not falling apart, approximately 1-1.5 hours, depending on the age of your beans. Heat a heavy-bottomed enameled cast iron pot (such as a Le Creuset) over medium heat, then cook sausage in olive oil until browned and a little crispy on the edges. Add garlic and cook until fragrant, 30-60 seconds, stirring constantly. Add the tomatoes with their juice and then add an additional can of water, being sure to scrape all of the delicious cooked bits clinging to the bottom of the pot. Add the cooked beans, along with their delicious broth, and then add the collard greens. 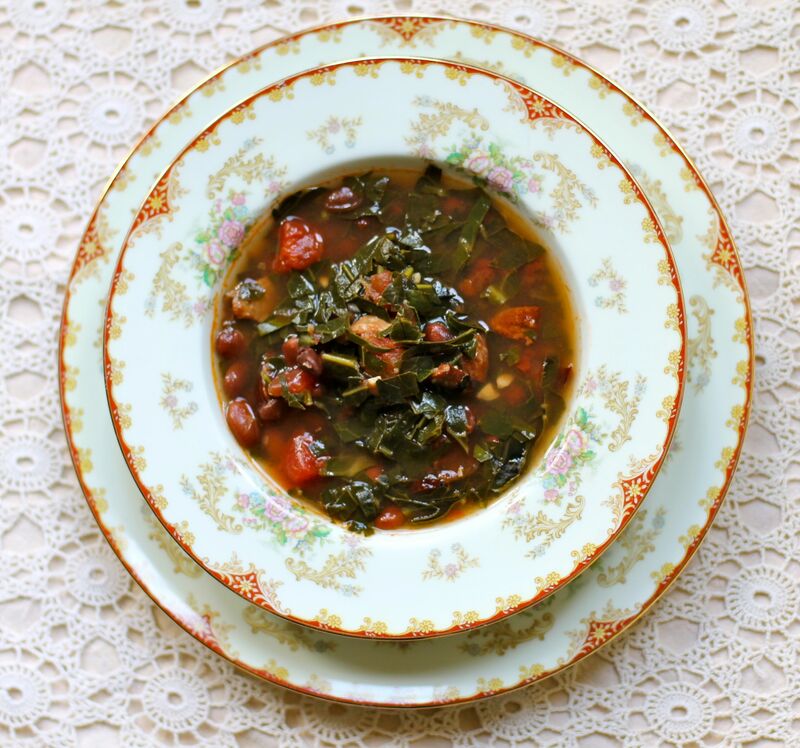 Bring the soup up to a simmer and cook until the collard greens have softened, 15-20 minutes. You may need to add more water (or flavored broth, like chicken or veggie), depending on how much liquid was leftover from cooking the beans. The soup is ready once the collard greens have softened. Be sure to check for salt and pepper ~ and add more if needed ~ according to your taste. A drizzle of cider vinegar will round out the flavor and give it a punch. As with most soups and stews, the flavor of this soup is even better the next day. The collards can be cooked and cooked and cooked again, so it’s a great dish to make ahead.